The longest running drama of all time, The Guiding Light got its start on Old Time Radio before making the transition to Daytime Television. Guiding Light is the longest running drama of all time. It began as a 15 minute old time radio show in 1937, running until 1947. It then ran through its metamorphosis into a television drama until 1956. In 1952, it became a television show and the radio and television programs ran concurrently for some time. Today this television show is still running. It was originally sponsored by Procter and Gamble, who put the "soap" in soap opera. The brainchild of Irna Phillips, this show is based on her life experiences. When she was 19, an unmarried Irna gave birth to a still-born child. At this time, she found comfort through listening to the sermons preached by Dr. Preston Bradley, a minister of a church for the brotherhood of man. These sermons then became the backbone for the creation of her dramatic serial, The Guiding Light, 27 years later. The show originally centered around a preachers' sermons. 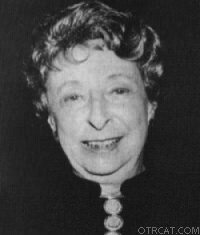 Irna Phillips later published these sermons, and they became a best-selling book. Guilding Light also generated the spin-off series, Right To Happiness. For other popular soaps, see also: Vic and Sade, Hearts in Harmony, One Mans Family, Eternal Light, Ma Perkins and Mary Noble Backstage Wife. 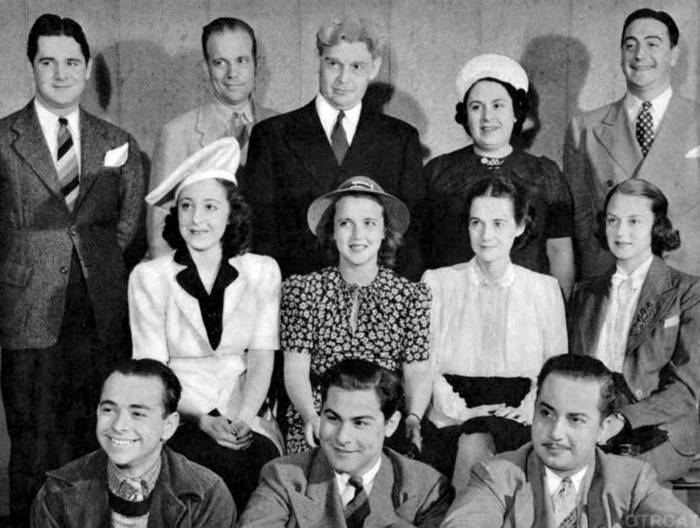 Cast from The Guiding Light from 1937. 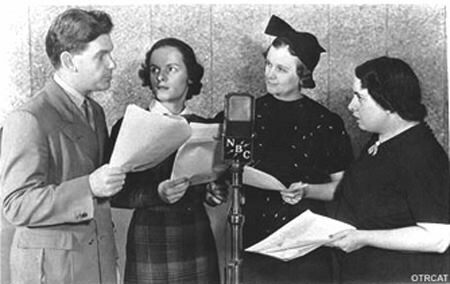 The actors are (left to right) - Arthur Peterson, Mercedes McCambridge, Helen Behmiller, Henrietta Ledro. I enjoy otr very much.especially mystery and drama.